These two mastheads are from the two official newspapers of the Paremata Māori or the Kotahitanga parliament movement. Huia Tangata Kotahi, meaning unite the people, was edited by Īhaia Hūtana from 1893 to 1895. 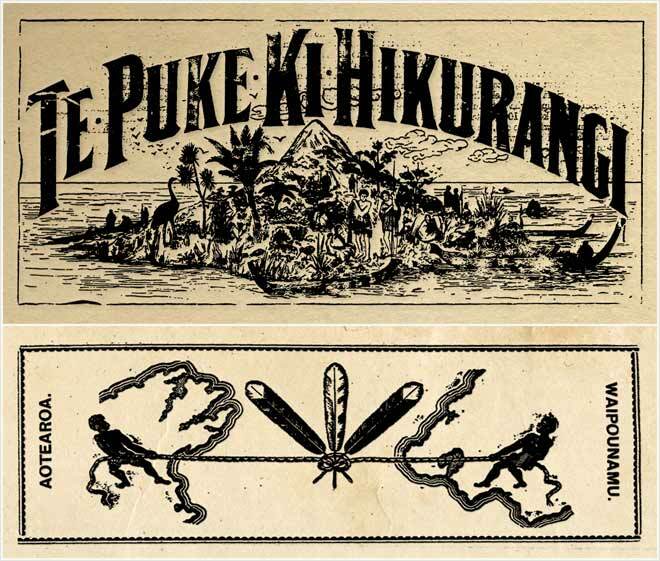 The masthead (bottom) shows two people, one on the top of the South Island, the other on the bottom of the North Island, holding a rope symbolising unity of the islands. Te Puke ki Hikurangi (top) began in 1897 and ran, with some breaks, until 1913. It was published under the authority of Tamahau Mahupuku and edited by Pūrākau Maika.